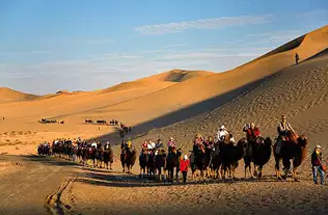 n the morning, we proceed to Turpan, an oasis amid the desert, and renown for its grapes and honeydew melons. On the way we enjoy the unique scenery of snow capped peaks, dragon-spruce tress and wild flowers. Visit the famous Karez Wells, an underground irrigation system that carries melted snow from Mt. Tianshan to the fields below. You will tour the ruins of the ancient city of Jiaohe and Sugong Minaret. Tonight taste roasted lamb and enjoy the Xingjiang folklore performance. 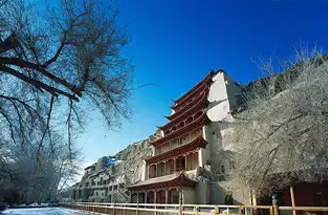 Xining, it has been central China's gateway to Tibet since the ancient times. It is also the area fro which the Yangtze and the Yellow Rivers originate. After breakfast, see those majestic temples and golden altars. Marvel at the jeweled pagodas of a mosque and visit the Temple of Tar. Later, we drive to Qinghai Lake, the China's largest salt lake. You will have a boat ride tour on the lake. You will never forget the turquoise blue water, the jadegreen pastures, the cleanest azure sky, the reed tents, the black oxen, the yellow blooms and the colorful Tibetan costumes. Experience the unique flavor of this border city where many different ethnic, cultural, and religious groups live in peace and harmony. In spring season (April to May), you can have an optional tour to the Bird Island if time allows. The island is populated by thousands of migratory birds during their breeding season, and it is a wonderful sight. Tonight we enjoy a delicious local hot pot. Fly to Xian, the cradle of Chinese civilization, was the state capital of 73 emperors spanning 11 dynasties during 1100 years dating from 4,000 B.C. On the way to hotel, you will see the ancient city walls. Visit Big Wild Goose Pagoda Square. This evening after an Imperial Dumpling Banquet Dinner, you will see a wonderful stage opera show of the Tang Dynasty, the one as being a “must see” in Xian. After breakfast, we drive to Mt. Huashan, one of five holy mountains in China. Ascend by cable to the top of this majestic mountain for a breath-taking view of its five peaks and the Yellow River.